In honour of the memory of its illustrious founder Louis Moinet unveils a visionary creation, positioning the chronograph not simply as a complication – but as a central component of the watch. As such, it was important for the creation to be markedly different from its forebear, as well as celebrate its heritage. While everything – or almost everything – chronograph-related already seems to have been invented, there was still one step nobody had dared take: no longer seeing the chronograph as a complication, but rather as the primary function of the timepiece. So much for watch chronographs; Memoris is the first chronograph-watch in watchmaking history. The starting point may be easy to understand, but turning it into mechanical reality required a great deal of effort. Sharing its strategic thinking with Concepto, the movement manufacturer that has worked alongside the brand since its outset, Louis Moinet considered the usual set of traditional watchmaking questions, but applied them to the chronograph: what should be highlighted, what techniques should be used, and what should be shown off? A thorough knowledge of the history of watchmaking led to the first answers. There can be no doubt that any noble chronograph must have a traditional clutch column wheel. What’s more, tradition dictates that it should feature a monopusher, the most delicate part of the exercise. And given its central role, it made sense to highlight the chronograph by having it occupy pride of place on the dial. That left the question of what to leave visible, on display. For Louis Moinet, the answer here was quite simply everything: with Memoris, the entire chronograph function has been shifted to the dial. The new caliber on Memoris is the LM54. With a rhythm of 28,800 vibrations per hour (4Hz), it has 302 components and provides a 48-hour power reserve. 147 have been designed and manufactured to allow the chronograph to be presented atop a dedicated movement plate, separating it from the automatic movement beneath. “Energie Plus” is an ingenious, automatic pawl winding system featuring an elegant spring with a ‘crab claw’ design. Completing the system, a miniature ceramic ball bearing is mounted on the dual-material rotor. The advantage of “Energie Plus” is that it allows the piece to be wound up in both directions, with a minimum of excess travel. 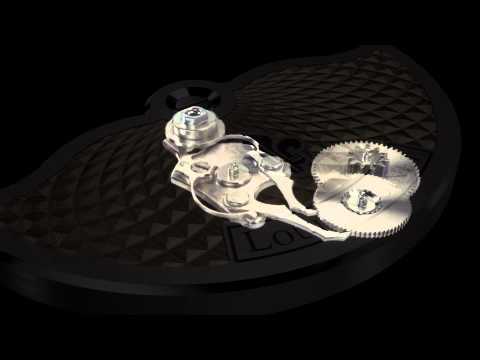 This optimizes each movement of the rotor, recovering its energy, and winding the movement more effectively.